Capital cities in Africa are listed below along with images, facts and travel information. There are 54 official countries in Africa and 2 disputed countries (Western Sahara and Somaliland). Each African country has at least one capital city, (see quick list). Some countries have a de facto capital and an administrative capital. The capitals vary widely in size, the largest African city is Cairo, with an estimated population of 17 million living in its metropolitan area. Maseru, Lesotho's capital has a population of 14,000. African capitals are not necessarily the largest cities in their respective countries nor the most populated. Nigeria is a good example. Lagos is a city of almost 8 million people whereas the official capital, Abuja, has a population of just 700,000. Many of Africa's capitals are generally not places of interest for the average tourist. But most of the international airports are based there, as well as embassies, major hospitals, large hotels and banks. Algiers is the capital city of Algeria in North Africa. 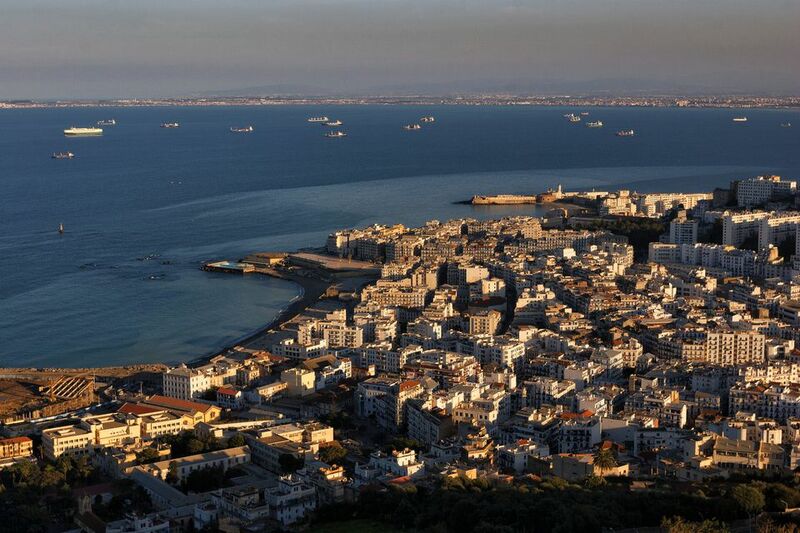 Algiers is located on a bay of the Mediterranean Sea and is an important port. Algiers was first settled over 1000 years ago and has now grown to a large city with a metropolitan population of over 3 million. While downtown Algiers looks modern, the capital is struggling to keep up with rapid growth and standards of living for most of its population is very poor. Algiers has also been marred by violence in the past decade. A civil war which started in 1991 has destroyed much of the country. In recent times things have quietened down yet two bombs exploded in the capital in December 2007. The bombings were linked to al-Qaeda. Algiers is the backdrop to one of my favorite movies, Battle for Algiers (1965). It's a riveting movie documenting the battle for independence in Algeria (from France) during the 1950's. Algiers is not a tourist hotspot and the US State Department warns against travel to certain parts of the country. In Algiers, most of the interesting sights are in the old part of the city known as the Casbah or Medina. The travelers that do make it to Algiers are impressed with the very friendly and hospitable people. The old French buildings, the promenade along the seafront and the food also get good ratings. Blog post from a recent traveler to Algiers in August 2008. Algiers Travel Blog, 2002 by Jelena. Includes lots of photos and practical travel tips. Continue to 2 of 45 below. Antananarivo (Tana) is the capital city of Madagascar and the largest city on this big island in the Indian Ocean. The city is situated inland, about 90 miles from the East coast. Antananarivo was founded in the early 1600's and its position on top of a high ridge made it easy to defend against enemy attack. Antananarivo means "the city of a thousand", a reference to the 1000 soldiers that supposedly protected the newly founded city during the reign of the revered King Andrianjaka. In 1895, the French took over and expanded it greatly to include many new buildings and roads. Madagascar gained its independence from the French in 1960. Today, Antananarivo has a population of about 1.4 million people. Tana will surprise you with its rice paddies, pollution, Asian looks, numerous stairs up steep hills, palaces, cobbled streets and churches. This is not Africa or Asia, Madagascar is totally unique. Most people traveling to Madagascar will arrive in the capital since the international airport is situated there. Antananarivo is a bustling place with lots of churches, a mosque, a zoo and plenty of markets called Zomas. The capital is basically built on 12 hills and steep steps lead to the main Independence square in the town center. The architecture is a mixture of old wooden houses, modern offices and French colonial style buildings. The best way to see Tana is to walk around and take taxis. Many visitors take a taxi up to the Rova in the Upper Town and walk around from there. The Tsimbazaza Botanical and Zoological Park houses some of Madagascar's unique flora and fauna including lemurs. Tana is somewhat typical of many cities in a developing country: lots of poverty, pollution, and crumbling infrastructure interspersed with modern cafes, restaurants and shops selling western goods. Local Tana Resident's Travel Guide - on Virtual Tourist. Antananrivo Travel Guide - from Travel Africa Magazine. Antananarivo Travel Blogs - find out what travelers are saying about Tana right now. Continue to 3 of 45 below. Nairobi's crime rate is quite high and the US Government warns travelers to visit with care. On a lighter note, Nairobi is unique in having a very good wildlife park situated just 5 miles from the city center. Nairobi is a major travel hub and most people stay for a night or two in transit. Getting around the city is easy by taxi, matatu or tuk-tuk. Nairobi National Park is one of Kenya's most successful black rhino sanctuaries, it also has its own wildebeest migration as well as over 400 species of bird. Good museums include the National Museum, the Karen Blixen Museum (of Out of Africa fame) and the Kenya Railway Museum. Carnivore Restaurant offers wildly interesting dishes. David Sheldrick Wildlife Trust houses elephant and rhino orphans. Nairobi Slum Tours -- for those interested in seeing how most of the city's inhabitants live. Recommended hotels include the luxurious boutique hotel Ngong House, where you can stay in a tree house, or the ultra modern Tribe Hotel. The family owned Fairview Hotel is the best mid-range option, and the tiny Miit Mingi Guesthouse for budget travelers. If you want to avoid the city center, check out Nairobi Tented Camp, just 15 minutes from Wilson airport and situated in the heart of Nairobi National Park. Around the leafy suburbs of Karen, there are some excellent boutique hotel options including: House of Waine, and Giraffe Manor. The Panari Hotel and the EKA Hotel are both close to the international airport. Click here for a list of my recommended hotels in Nairobi. Nairobi has many restaurants serving a wide variety of cuisines. For people-watching grab a snack at the Thorn Tree Cafe. Fresh seafood can be had at Tamarind, and French cuisine at Alan Bobbe's Bistro. Of course the Carnivore Restaurant is perfect for meat lovers. Nairobi city tours are a good option for those worried about their personal safety. Continue to 4 of 45 below. Cairo is the capital and largest city in Egypt, North Africa. More than 17 million people live greater Cairo which makes it Africa's most populated city. About 8 million people live in the city proper. Egypt is Africa's most popular tourist destination and most visitors will spend at least a day or two in Cairo. Cairo is situated on the banks of the Nile River in Northern Egypt. Cairo has been a tourist destination for thousands of years because on the outskirts of this great city you'll find the last remaining ancient wonder of the world, the Pyramids of Giza and of course the Sphynx. Cairo is not for the faint of heart. Traffic lights are routinely ignored and donkey carts still vie with cars for the right of way. Mosques and minarets mingle uneasily with gleaming skyscrapers. Cairo is a shoppers paradise (if you like to bargain), an archaeologists' fantasy, and a drivers' nightmare; Cairo is all of these and more. Follow the links below for more information. Continue to 5 of 45 below. Kigali is the capital city of Rwanda. Kigali is Rwanda's biggest city with a population of 850,000, it's also the commercial capital of the country. Kigali was founded by the Germans in 1907 but only became Rwanda's capital when the country became independent (from Belgium) in 1962. Kigali was at the center of the horrendous genocide that took place in 1994 which took the lives of 800,000 people and displaced many more in the space of just 100 days. Since 1994, Kigali has slowly been rebuilt and income from tourism (mostly coming to see the gorillas) as well as numerous aid workers have buoyed the capital's economy. Kigali is a relatively safe and sophisticated small city, it has come a long way in a short time. Kigali is a pretty city which sprawls over several hills, its avenues are filled with flowering trees and it is surrounded by lush green mountains. In Kigali you'll hear people speaking Kinyarwanda, English, and French. Kigali Genocide Memorial Center contains a permanent exhibition of the genocide. The center is built on a site where over 250,000 people are buried. Caplaki - market stalls where you can shop for woodcarvings, drums, baskets and ceramics. Prices start high, so be prepared to bargain. The Dancing Pots - offers visitors a chance to buy some Batwa pottery and learn more about the Twa people. Recommended hotels: Hotel des Milles Collines (the actual Hotel Rwanda), an upscale choice and one of the best hotels in Kigali. Another good high-end hotel is the Kigali Serena. The Hotel Gorillas and Hotel Chez Lando are good mid-range options. The Lonely Planet Guide likes the Kigali Hotel for those on a budget. Recommended restaurants: Aux Caprices du Palais for French cuisine; Addis Ethiopian for Ethiopian dishes; India Khazana (Tel: 08499600 ) and La Sierra for Indian food; and Sol e Luna for some Italian. City Tours are offered for around $20 per person, check with your hotel for more information. Continue to 6 of 45 below. Dar es Salaam is Tanzania's capital city and the largest city in the country. Located in southern Tanzania on coast of the Indian Ocean, Dar is a bustling, chaotic place, filled with life and color. Get your facts and information about Dar es Salaam below the image. Dar es Salaam is primarily a port city in southern Tanzania, located on a huge natural harbor. "Dar es Salaam" means "haven of peace", but you'll find with almost 3 million people calling the city home, it's not exactly tranquil. Dar es Salaam it is the economic heart of the country, the high rise business district buzzes with activity throughout the day. The government was officially moved to Dodoma in the center of Tanzania in the 1970's, but Dar es Salaam is the true capital and the central government by and large still operates from here. Visitors to Dar es Salaam are usually en route to Tanzania's fantastic southern national parks including the Selous and Ruaha, or catching a ferry to the exotic Zanzibar archipelago. The best time to visit Dar es Salaam is during the dry season from June - October, otherwise temperatures can get very hot and humid (but you can always dip in the Ocean). The easiest way to see Dar es Salaam's attractions is by taxi, unless you've been in the country a while and know how to figure out the mini-bus taxi system which is cheaper. There aren't a lot of major attractions, but if you've been on the road for a while, Dar offers the chance to get some good food, stock up on supplies and swim in a nice hotel pool. Take a walk in the older parts of town to check out the German and British colonial buildings. Shopping for cloth and t-shirts is fun in the Asian district northwest of the main drag Samora Avenue. Arts and craft shops are plentiful too, check out Nyumba ya sanaa (the Mwalimu Nyerere Cultural Center). For some original Tingatinga paintings, head to the Tingatinga Center on Haile Selassie Road. The Mwenge Carver's Market is great if you like wood carvings. The National Museum - From fossils to cars, this museum has a little bit of everything that touches upon Tanzania's history. Some of the early hominid findings courtesy of the Leakeys are on display here (some from the Olduvai site in Northern Tanzania). There are also cultural displays from the various tribes that make up modern Tanzania. Kariakoo market - Lively central market that takes up several city blocks, with people selling everything from vegetables to school bags. Fish Market - Guaranteed to be a lively morning when you head to the fish market and watch the daily catch come in. If you'd like to escape town and snorkel in the Ocean, check out Bongoyo Island, part of a marine reserve. You can catch a boat out to the island (30 minutes) from the Mashua Waterfront Bar & Grill at Slipway, north of the city center in the Msasani Peninsula. It's wonderful for snorkeling and chilling on the beach. There are plenty of hotels in the city center to choose from. If you'd prefer to be out of the urban hubbub, check out the luxurious Ras Kutani just south of the city on the coast, or the Amani Beach Hotel. Just north of the city, have a peek at The Retreat, a very nice boutique hotel on the beach. Budget/Mid-range hotel options include: Jambo Inn Hotel, Palm Beach Hotel, Mediterraneo Hotel, Swiss Garden Hotel, and Hotel Slipway. Travelers and expatriates favorite pub is either O' Willie's or the Slipway pub. The best rooftop bar is the "Level 8" on the roof of the Kilimanjaro Kempinski Hotel. You can get all kinds of cuisines in Dar es Salaam, good Ethiopian at Addis in Dar and upscale Indian food at Nawabi Khana (but there's lots of good Indian food to get in the Asian neighborhood for cheaper). Japanese/Thai food is excellent at the Oriental. Traditional dances are held at the Mwalimu Julius K Nyerere Cultural Center every weekend. For more on what's happening in Dar check out Dar 411. Dar es Salaam's Julius Nyerere International Airport (DAR) lies 10 km out of town. Daily flights come in from Europe on KLM, BA and Swissair. Middle East options include Emirates and Qatar. Regional airlines that fly in daily include Kenya Airways, Ethiopian, EgyptAir, and South African Airways. Domestic flights are well served by Precision Air. If you are traveling by bus, Scandinavian Express has daily service to Nairobi (Kenya), Kampala (Uganda) and Arusha (northern Tanzania). The main express bus terminal is on Msimbazi Road, on the corner of Nyerere Road, in central Dar es Salaam. Ferries to and from Zanzibar: There are several daily high-speed ferries from the port in Dar es Salaam to Stonetown on Zanzibar. The trip takes about an hour and a half and tickets can be bought on the spot from the ticket office (or touts) for US Dollars. You need your passport as authorities will ask to check it. There is a very limited train service out of Dar es Salaam, but fun if you can get on it and have the time! Tazara trains run between Dar es Salaam and Mbeya (handy to get to the border of Malawi and Zambia). The Tanzania Railway Corporation (TRC) runs the other railway line and you can travel from Dar es Salaam to Kigoma and Mwanza; and also along the Kaliua-Mpanda and Manyoni-Singida Branch Lines. See Seat 61's passenger-train schedules to find out when the trains run. Continue to 7 of 45 below. Harare is the capital city of Zimbabwe in southern Africa. Harare is Zimbabwe's biggest city with a population of around 2 million; it's also the commercial capital of the country. The British founded the city in 1890 and called it Salisbury. When Zimbabwe gained independence in the early 1980's, the name was changed to Harare after a Shona chief, Neharawa. Harare is a fairly cosmopolitan capital, with an excellent climate. It's easy to walk around central Harare, there are lots of shops, parks, banks and restaurants in the city-center as well as high-rise office buildings. There are nicely maintained suburbs where the wealthier folks live along with several golf courses. The outskirts of Harare are filled with townships that are home to most of Harare's workers. Shona, Sindebele and English are the most common languages spoken in Harare. Visitors fly into Harare via London (on BA and Air Zimbabwe) or Johannesburg (on SAA or Kulula). Regional airlines include Air Zimbabwe, Air Botswana and Malawi Airlines (web site coming soon!). Long-distance buses travel between Harare and Blantyre (Malawi), Johannesburg (South Africa), and Lusaka (Zambia). Minibuses and taxis will get you around Harare. Commuter trains are used by locals making their way from the townships into the city center. It's not advisable to walk around Harare at night. Where to Stay: Meikles Hotel (high-end, central location); Bronte and Baines B&B (luxury/mid range, Harare suburbs); Imba Motombo and Wild Geese Lodge (luxury, outside city center); ​Small World Backpackers Lodge. Where to Eat: Amanzi (International); Keg and Maiden (British Pub food); Shangri-La (Chinese); Kwa Mereki (African BBQ). Harare Gardens and Africa Unity Square -- two parks that are worth checking out. Have a coke, enjoy street performers and watch Harare's youth stroll by. Tobacco Auctions -- as a major tobacco producer, the auctions are fascinating to watch, tours are available (April - October). Chapungu Sculpture Park -- a recreated Shona village with an excellent gallery showcasing Shona sculpture. National Botanic Gardens - 58 hectares of gorgeous flowers, trees and shrubs. National Gallery -- good display of African art and traveling exhibits. Harare International Festival of the Arts -- excellent cultural festival, not to be missed in April/May. Continue to 8 of 45 below. Kampala is the capital city of Uganda in East Africa. Over 1 million people live in Kampala making it Uganda's largest city. Kampala was the capital of the Bugandan Kingdom several hundred years ago. Today, Kampala is a modern looking city, with outlying townships spreading far beyond the original "seven hills" the city was built upon. Many of Kampala's more modern buildings were built in the 1980's since the city suffered significant destruction during the "Liberation War" between Tanzania and Uganda in the late 1970's. The war was fought to oust the brutal dictator, Idi Amin who was in power during that time. Kampala is built close to the shores of Lake Victoria, the world's second largest fresh water lake and the source of Nile River. English, Swahili and Luganda are the predominant languages spoken in the streets of Kampala. Kampala is one of Africa's "greenest" cities, with parks, gardens and golf courses in the city center. This reputation may not last long however as Kampala is one of the fastest growing cities in Africa. Kampala is a relatively safe city, (despite the awful terrorist attack in 2010). You can walk the main streets at night without too much fear of getting mugged or robbed. The center of the city is relatively clean, the bars and nightclubs are fun, (check out the Kabalagala district) and there are plenty of restaurants. Most of the large banks, offices, big hotels and embassies are situated on Nakasero Hill. At the bottom of Nakasero Hill, the streets get more congested with traffic as well as pedestrians and hawkers selling goods along the sidewalks. There are several Hindu temples and Mosques as the Indian community has a long history in Uganda and play a big role in the economy. Kampala's attractions aren't too plentiful. It's a nice city to stay in and use as a base for exploring the country further (and the Indian food is great). But if you have a few afternoons to spare, you can visit the Kasubi Tombs, the Uganda Museum and follow the Kabaka's Trail, which takes you to the pretty Ssesibwa Falls on this cultural Bugandan heritage tour. The best way to get around Kampala is by taxi or mini-bus. Continue to 9 of 45 below. Equatorial Guinea's capital Malabo is located just off the mainland on Bioko island. It's an oil town these days, with some high end, expensive hotels and lots of oil platforms dotted around the harbour. Because of the oil industry, Malabo is a fairly cosmopolitan city and there are plenty of restaurants and bars to enjoy especially along the main street in town, Ave de la Independencia. In January 2012 Malabo co-hosts the Africa Cup of Nations, so the town will be filled with fans and soccer players alike. Malabo is a relatively small capital, with a population hovering around 100,000. The Portuguese explorer Fernão do Pó, was the first European to discover the island of Bioko in 1472. He called it Formosa ("Beautiful"), but it ended up being named after Fernao himself and officially colonized by Portugal in 1474. In 1778, the island, adjacent islets, and commercial rights to the mainland between the Niger and Ogoue Rivers were ceded to Spain in exchange for territory in the American continent. As an important settlement, Malabo started life as Port Clarence in 1827, after the British leased Bioko island from the Spanish, to establish a naval station to help fight slavery along the coast. Newly freed slaves called Fernandinos settled in the town and their descendents can still be found in Malabo today, speaking an Afro-Portuguese dialect. When the Spanish regained control of the island, it was renamed Santa Isabel and finally Malabo in 1973 after independence. Malabo became the capital city of Equatorial Guinea in 1969, replacing Bata on the mainland, (which is still a larger city to this day). Malabo lost much of its soul during the 1970's under the then President Macías Nguema, who led a reign of terror on the dominant tribe of Bioko island, the Bubi. Talk to anyone in Malabo today and you'll find out that this period of darkness still affects them. Despite being an oil-rich town, Malabo has a fairly poor infrastructure. Paved streets are few and far between and the Spanish colonial buildings are somewhat faded along the main avenues. But the markets are lively and there are some worthwhile sights to keep visitors occupied. Attractions include the Cathedral and exhibits at the French and Spanish Cultural centers. The dry months between December and February is the best time to visit Equatorial Guinea. It is warm year round. Malabo is located on Bioko island, there are some ferries to the mainland, but they take a long time so it's best to fly to Bata, or neighbouring capitals in Cameroon (Douala) and/or Libreville (Gabon). Continue to 10 of 45 below. Gaborone is Botswana's capital city and its commercial hub. Gaborone has a population of around 250,000 people. It's located in a valley on the Notwane River, in the south-east corner of Botswana ( see map), close to the border of South Africa. Gaborone was named after Kgosi (Chief) Gaborone who led the Batlokwa tribe into the area in the 1880's. The small town grew into the administrative center of Bechuanaland, a British protectorate (1885 -1966). When Botswana gained independence in 1966, Gaborone became its capital. Gaborone is a fairly affluent city, with shopping malls, restaurants, some nightclubs, decent hotels and a University. It's a small city, not very lively or vibrant but quite safe, tidy and relaxing. Gaborone is the setting for Alexander McCall Smith's delightful detective series, The No 1 Ladies Detective Agency, and home town of his leading lady, Precious Ramotswe. The Mall -- the hub of Gaborone is The Mall, a main street lined with shops, banks and craft sellers. The National Art Gallery -- an excellent place to learn more about Botswana, it's history, ecology and culture. No 1 Ladies Detective Agency Tours -- Alexander McCall-Smith's detective series put Gaborone on the map. Take a tour and see Precious Ramotswe's, home town come to life. Gaborone Game Reserve -- small reserve with good roads, you can see ostrich, rhino, kudu, eland, zebra and a huge array of birds. Botswana's main international airport, Sir Seretse Khama International Airport (airport code: GBE) is located 9 miles outside of Gaborone. Airlines that operate include: Air Botswana (to/from Harare, Johannesburg, Lusaka, Nairobi, Victoria Falls, Windhoek), Air France, Air Zimbabwe, South African Airways and British Airways. Long-distance buses to Gaborone are available from Johannesburg and Pretoria on the Intercape Mainliner. You can also reach Gaborone from other cities and towns in Botswana, either by mini-bus or intercity coaches, some operated by Seabalo. Botswana Railways suspended passenger services in April 2009. Hotels in Gaborone are modern and most have little personality. Recommended hotels include: Cresta Lodge; Gaborone Sun Hotel and Casino; Oppi-Koppi Bed and Breakfast; Mokolodi Backpackers. For a full list of hotels, Click here. Continue to 11 of 45 below. Freetown is the capital of Sierra Leone in West Africa and just over one million residents live there. Freetown was founded in the 1780's as a home for freed slaves from North America and the Caribbean. The freed slaves who settled Freetown were called Krio and they brought their unique language with them (also called Krio or Creole) which is the predominant language of Freetown today. Freetown is situated on a peninsula jutting out into the Atlantic Ocean and is Africa's largest natural harbor. Freetown is etched in many peoples minds as the backdrop to one of the world's most horrendous civil wars which included a military operation called "Operation No Living Thing". The civil war lasted from 1991-2002 and left hundreds of thousands of civilians dead and many more maimed for life. The war was basically about controlling the lucrative diamond trade. Check out Sorious Samura's incredible documentary "Cry Freetown" for more. In 1792 when freed slaves came to settle Freetown, they built their houses around a cotton tree which still stands today. Freetown bears the scars of the civil war but it is slowly regaining its vibrancy. There are still lots of war refugees in town but there is an optimism present despite the noise, traffic jams and general Lumley Beach is particularly popular. Many of the better hotels are situated on, or close to the beach. Lush, green mountains provide a nice backdrop to the city. Major sights in Freetown include The Cotton Tree (see above), the National Museum, several churches and mosques that date back to the 1820's, and West Africa's oldest University, Fourah Bay College founded in 1827. Markets in Freetown offer lots of color, bargaining and relatively inexpensive tourist trinkets. The best way to get around Freetown is by taxi. Getting from Lungi International Airport to Freetown requires a ride in a helicopter, ferry or hovercraft, an exciting way to enter a city. Freetown guide from VisitSierraLeone.org, a locally owned and run organization promoting tourism in Sierra Leone. Welcome to Sierra Leone -- The official site of the Sierra Leone National Tourist Board. Continue to 12 of 45 below. Gabon's capital city Libreville is a vibrant city with a population of around half a million people. Compared to other regional capitals, Libreville is a fairly modern looking town in parts, with casinos and large hotels lining the best beaches in town. It's not cheap, but the beer and wine is plentiful and the restaurants are very good if you can afford the French/African upmarket restaurants. Libreville was founded as a town by freed slaves in 1848. The French navy had stopped a Portuguese ship carrying the slaves to Brazil, and let the liberated men and women settle in Libreville. "Libreville" means free town in French. The city grew slowly up until independence from France in 1960, and since has steadily increased its population, whereby almost half of all Gabonese now live in the capital. Libreville is a mixed bag of a city, wide boulevards with modern buildings can give way to ramshackle neighborhoods and areas showcasing soviet architecture at its most drab. The best way to get around Libreville to all the attractions, is by taxi. Musee des Arts et Traditions offers a good insight into Gabon's thriving traditional arts scene. Plenty of masks, sculptures and traditional crafts on display. To buy your own masks and curios, head for the artisan market. Traditional Ceremonies - traditional Bitwi performances and ceremonies are offered by several associations in town, one that comes recommended is the Ebando Association. Beaches in Libreville are plentiful, a little outisde of town is the popular Pointe Denis and Ekwata island. In town, head for the fancy hotels to use their pools and beaches. Presidential Palace, built in 1970, is an interesting building that rises from the low-lying landscape of the city. The drier cooler months between June - August is the best time to visit Gabon, or the short dry period between December - January. It is warm and tropical year round. Most visitors will arrive by air, and land at the Leon M'ba International Airport in Libreville. Airlines with regular flights to Gabon include: Air France, KLM, Lufthansa and Emirates. Regional destinations are covered by: Gabon Airlines, South African Airways, Ethiopian Airlines, Royal Air Moroc, Rwandair Express and Kenya Airways. Libreville is home to several European chain luxury hotels, all offer similar facilities at high prices. The better ones include: Le Meridien Re-Ndama, Résidence Le Maisha. Good options for those on a budget or paying their own way include: Hotel Tropicana, and Le Patio. Continue to 13 of 45 below. Dakar is the capital city of Senegal in West Africa. Over 1 million people live in Dakar (double that for the whole metropolitan area) making it Senegal's largest city. Dakar is located on the Cape Verde peninsula that juts into the Atlantic Ocean. It was first settled in the early 15th Century and the Portuguese arrived just a few decades later to set up slaving forts on Goree Island (Ile de Goree). Dutch, French, British and Portuguese colonialists vied with each other over the next 250 years for control over the slave-trade until it was permanently abolished by the French in 1815. Today, Dakar is a sprawling, lively cosmopolitan city. Modern buildings stand side by side with impressive colonial architecture. Bustling markets selling everything from second hand clothes to livestock are scattered throughout. The nightclubs are legendary. It's a big African city so it's chaotic, crowded, dusty and hustlers abound especially around the beaches and markets. The central Place d’Independence is a good place to orientate yourself from. If you speak French, you'll have no problem conversing with anyone in Dakar. Direct flights from the US can be found on Delta and SAA. Fly direct from Paris (AF), Brussels (SN), and Amsterdam (KLM). Dakar is a regional hub and you can get to most West African capitals. Air Senegal is the national airline. The best way to get around is by taxi, or try a scooter tour. Where to Stay: Recommended hotels include: Le Meridien President (luxury); Hotel Djoloff (mid-range, boutique); Hotel du Phare Les Mamelles (budget/mid); SenegalSTyle B&B(budget). Popular restaurants include: La Fourchette (upscale); Keur N'Deye (mid-range). Nighclubs: Just 4 U; Club Thiossane (owned by Youssou N'Dour); More restaurant reviews, and more recommended nightclubs. IFAN Museum: One of Africa's oldest art museums, IFAN is a treasure trove of masks, musical instruments, carvings and more from all over Africa. Goree Island: It's just a boat ride away to this tranquil island that was a major slave-trading post. Visit the "House of Slaves" for a poignant reminder of the horrors of slave-trading. Continue to 14 of 45 below. Tunis, the capital of Tunisia, is often ignored by the many European tourists who flock to Tunisia's beach resorts. But they're missing a true gem of a city, particularly the Medina, which rivals that of Marrakech and Fes in Morocco. The main avenue leading to the medina is lined with tropical trees giving shade to the numerous sidewalk cafes. Perfect to enjoy a coffee and watch the world walk by. Tunis is a very modern town, safe and pleasant. The restaurants are good and offer fine cuisine that's a mix of Arab and French. Enjoy a local hammam if you're brave and want a good scrub and massage. Tunis is home to one the best museums in North Africa, The Bardo, which is housed in a beautiful palace filled with the treasures found at numerous ancient sites dotted around Tunisia. It's easy to get to, just jump on tram number 4. The local tourist offices have maps and are helpful, their employees speak fluent French and decent English. While there are many hotels in Tunis, a light rail system makes it very easy to stay in the gorgeous, picturesque village of Sidi Bou Said on the coast, just 20 minutes away. En route are the ancient ruins of Carthage. Getting around Tunis is easy by foot, light rail or taxis. Just make sure the taxis use their meters. More about travel in Tunisia. Continue to 15 of 45 below. Continue to 16 of 45 below. Addis Ababa is the capital city of Ethiopia in East Africa. Around 3 million people live in Addis Ababa. Addis (as it's commonly referred to) was founded by Emperor Menelik 11 in 1887. Addis is the third highest capital in the world at 2440m. It's a sprawling city that takes some getting used to. Mud huts, Italian facist architecture, glitzy hotels, cathedrals and marxist billboards provide the backdrop to Africa's fourth largest city. Nightclubs and restaurants serving international cuisine rub shoulders with bars serving traditional honey wine (Tej). Despite its mix of wealth and poverty, tradition and modernity, Addis is a safe city with little violent crime but lots of petty theft. You'll need at least 2 days to enjoy the major sights of Addis, city tours are available. National Museum -- See the 3.5 million year old hominid fossil skeleton, Lucy. St George's Cathedral -- Built to commemorate the defeat over Italy in 1896 and the site of Haile Selassie's coronation (as the King of Kings) in 1930. Holy Trinity Cathedral -- Important place of worship and final resting place of Haile Selassie. Merkato -- Shop 'til you drop in one of Africa's largest markets, but watch out for pickpockets and go with a local to guide you. Hotels: Business travelers usually opt for the high-end Sheraton Addis or the Hilton Addis. Mid-range try Adot-Tina and Z Guesthouse. Budget hotels in the Piazza district include Taitu Hotel and the Baro Hotel. Restaurants/Bars: There are many excellent restaurants in Addis (see listing). For Ethiopian try Habesha and Teshomech Kitfo House. For going out see travelers reports about the bar and nightclub scene in Addis. Money Note: Most ATM's in Addis do not accept foreign cards so bring cash or travelers checks. Churchill Avenue is the main thoroughfare in Addis and it's best to orient yourself around it since street names either don't exist or have changed. Minibuses and taxis are readily available, give the driver the name of a place rather than an address. Continue to 17 of 45 below. South Africa has 3 capital cities. Pretoria is the administrative capital, Cape Town is the legislative capital and Bloemfontein is the judicial capital. Pretoria (Tshwane) is South Africa's administrative capital and is located in Gauteng Province. Over 2 million people live in Pretoria and this is also where all the foreign embassies are located. It's a well planned out, large city, see map. The main street, Church Street is 26 km (16 miles) long. Many of the hotels, museums and restaurants are in the center around Church square, to the east in Arcadia and south in the upscale suburb of Waterkloof. The Johannesburg International Airport about a 40 minute drive from Pretoria and shuttle buses offer frequent service. Trains run from Jo'burg, Durban, and Cape Town. You could splash out and get the famous, ultra-luxurious Blue Train from Cape Town. Renting a car is easy, it's about a 40 minute drive from Johannesburg, 5 hours from Bloemfontein, 15 hours from Cape Town. Five major highways meet nearby, so it's easy to get to from anywhere in the country. Catch a long-distance bus on the Translux, Greyhound, or Intercape Mainliner. Stay in a township or at one of Pretoria's many hotels, B&B's and Guesthouses. For budget travelers check out the Hatfield area. Pretoria has lots of excellent restaurants, for a good list click here. For bars and nightlife head over to the Hatfield area near the University. Buses, taxis and a train will get you from city center to the Loftus Versfeld stadium. Union Buildings -- where South Africa's Presidents are sworn in and Government governs from. Continue to 18 of 45 below. Continue to 19 of 45 below. Lusaka is the fast-growing capital city of Zambia in Southern Africa. Around 3 million people live in Lusaka making it Zambia's largest city and commercial center. The British established Lusaka as the capital of Northern Rhodesia in 1935, it remained the capital once Zambia gained independence in 1964. Lusaka has a modern looking business area, lots of scrambling shanties on its outskirts, lively markets, decent nightlife and some upscale hotels and restaurants. Cairo Road is the main avenue in town, lined with shops, banks and businesses, west of Cairo Road is considered the center of town. Click here for a basic tourist map. Main languages spoken in Lusaka are English and Nyanja. Lusaka is not an unsafe city but petty theft is common given the high number of unemployed, so don't walk around with valuables and take a taxi at night. Lusaka National Museum - Zambian history, ethnography and contemporary art is on display. Munda Wanga Environmental Park has an impressive botanical garden, wildlife sanctuary, and swimming pool. Kalimba Reptile Park for your fill of snakes, crocodiles, tortoises, and chameleons. Sample a crocodile burger. Kabwata Cultural Village for local handicrafts, lots of wood carvings to bargain for. Markets - check out City Center and Soweto Markets. Taj Pamodzi (high end, business, good Indian food), Southern Sun Ridgeway (high end), Inter Continental (high-end, diplomatic district) Eight Reedbuck Hotel (high end, boutique hotel); Lusaka Hotel (mid-range and central); KuOmboko Hostel (budget, backpacker accommodation); and Lusaka Backpackers (formerly Chachacha - popular, budget). There are Indian, European, Italian and Chinese restaurants in Lusaka. Try Chit chat cafe for excellent, informal dining; Fra-gigi for Italian food; and the Dil for Indian. Here's a full list. Minibus taxis are everywhere and ply set routes, a cheap way to get around. Private taxis can be called and will get you from A to B more efficiently. Continue to 20 of 45 below. Continue to 21 of 45 below. Monrovia is the capital city of Liberia in West Africa, it's located on the Atlantic Coast. Just over 1 million people live in Monrovia making it Liberia's most populated city. Monrovia was founded in 1822, named after US President James Monroe, who was in favor of re-settling freed African-American slaves. As the city grew during the next century it was divided into two sections, one for the returning African-Americans and the other for the existing local population. The city continued to grow as more people moved into Monrovia from the countryside. Things were looking up in the late 1970's as Monrovia's public housing and education system saw significant improvements. Unfortunately this came to a dead halt in 1980, when Samuel Doe led a military coup and Liberia was caught in two consecutive civil wars, infamous for their destructive violence. Today, Monrovia is at peace and Africa's first female president is in charge. Monrovia is a working port, but it's sprawling neighborhoods are generally poor with intermittent electricity. Despite its past, Monrovia has a friendly reputation thanks to its warmhearted residents. The most common languages you'll hear in Monrovia are English, Bassa and Kru. You can fly to Monrovia's International Airport via Belgium on Brussles Airlines, or via London on Astraeus Airlines. Regional airlines include Eylesian Airlines and Kenya Airways. Delta may operate flights in June 2010 from NY. Liberian National Museum - looted during the war, but some interesting items remain. Providence island - where the freed American slaves first arrived. Beaches - Kendeja, Silver Beach, Ellen's Beach. Mamba Point Hotel; Moko's Bed and Breakfast; Royal Hotel; Kendeja Resort Villas (just out of town, where the old cultural center used to stand). Sundowners are popular at Mamba Point Hotel, Lebanese cuisine can be tried at Beirut and the seafood is fresh and delicious at The Anchor. Liberian local dishes can be found throughout the city of course, Auntie Nana near the Cathedral, is a good lunch bet as is La Pointe Restaurant. Good night spots include La Noche Bar and Deja Vu. Taxis are the best way to get around town. Continue to 22 of 45 below. Continue to 23 of 45 below. Continue to 24 of 45 below. Continue to 25 of 45 below. Port Louis - bustling port, market town, horse racing capital, former home to the Dodo, and much more... see below for info. Port Louis is the capital city of Mauritius, an island in the Indian Ocean, east of Madagascar. Around 150,000 people live in the capital, a bustling port on the north-west coast of the island. Port Louis is one of Africa's busiest commercial ports, it's also a popular landing spot for cruise ships. It has a rich history, the harbor was in use by traders as early as the 1630's. The French made it the administrative capital as early as 1735 and used it as a provisions center for their ships sailing around the stormy Cape of Good Hope. Port Louis was named after the French King Louis the XV (1710-1774). Port Louis is truly a microcosm of the world today. It's population is total melting pot of cultures, languages, traditions and religions. The grandest architecture reflects its early colonial history which is now battling for sea views with sky-scrapers. The modern concept of a "waterfront mall" is alive and well in the form of Le Caudan. But the heart and soul of the place can be found in its bazaars (markets). This is where housewives and restaurant owners mingle in the early hours of the morning to buy their fresh produce for the day. Cathedrals, Mosques and Temples - St Louis Cathedral, Jummah Mosque, and Kaliammen Kovil (Hindu Temple). Champs de Mars - A great Saturday out watching the horses race and mingling with the locals. Natural History Museum - Featuring the Dodo! Central Market - From fish to key chains , Farquahar Street is still the shopping heart of the city. Caudan Waterfront - Restaurants, bars and duty-free shops. If you're spending a few nights in Port Louis, check out: Le Labourdonnais, Le Suffren, and Villa Jorico. Mauritian cuisine is absolutely delicious, especially if you like seafood and/or spicy, Indian cuisine. Try the snack food available at little stalls in the central market, Dhal Puris Stall is popular. For Chinese food, head to Chinatown and check out the First Restaurant. For views and international cuisine check out L'escale. Continue to 26 of 45 below. Ouagadougou is the capital city of Burkina Faso in West Africa. Almost 1.5 million people live in Ouagadougou, making it Burkina Faso's largest city and its commercial capital. Ougadougou was founded in the mid 15th century by the Yonyonse tribe who named the area “Wogodogo,” meaning "where people get honor and respect". It soon became the capital of the Mossi Empire. When the French colonized what was then called French West Africa in the 1890's, (later Upper Volta and now Burkina Faso), they gave Wogodogo a French accent, and named the capital Ougadougou. Today, Ouagadougou (commonly called Ouaga - pronounced wa-ga) is a sprawling city with a lively economy. The city is also a major cultural center and hosts the biennial FESPACO film festival. The heart of the city is focused around the Grand Marche, newly built since the last one burned to the ground in 2003. Ouagadougou is laid out in a grid-like pattern and is easy to navigate from the Place des Nations Unies (pictured above) where the city's 5 main roads converge. In Ouaga most people speak French, More, Dyula and Fulfulde. Ouaga is home to Burkina's international airport. Air Burkina is the national airline serving domestic and regional cities. You can also fly direct from Paris on Air France. Musee National - Housed in a new complex, you'll find tribal artifacts, masks and textiles. Moro-Naba Palace - You can't go in, but do attend a traditional ceremony held outside the gates at 7am every Friday. Grand Marche - newly reconstructed after a fire burned it down, the market is still a lively place for bargaining. Le Musee de la Musique - a good selection of traditional musical instruments. Village Artisanal - Great place to watch local craftsmen at work. Luxury - Laico Ouaga 2000 Hotel; Mid-range - Hotel OK Inn and Hotel Les Palmiers; Budget - Le Pavillon Vert. Ouaga is easy to get around by taxi. You can travel to and from the capital by train or long-distance bus to Burkina's other main towns as well as Ghana, Cote D'ivoire, Benin, Mali and Niger. Continue to 27 of 45 below. Continue to 28 of 45 below. Continue to 29 of 45 below. Lilongwe is Malawi's capital, a pleasant enough city where you'll find embassies and government departments. It's a planned capital, and the population is smaller than Blantyre, at around 1 million. The "new town" is spread out with modern office buildings and residential areas. The "old town" is much more lively with a really great market where you can buy everything from bikes to fans. Just watch your valuables here and enjoy a little bartering. Lilongwe is a good place to regroup if you've been on the road for a while, lots of accommodation options and some decent restaurants can be found in both the old and the new town. The Lilongwe Wildlife center and the tobacco auctions (see above) are two of several worthwhile attractions in the capital. Some of the embassies and cultural centers host local art shows which are worth attending, check local papers for information. Continue to 30 of 45 below. Continue to 31 of 45 below. Continue to 32 of 45 below. Continue to 33 of 45 below. Khartoum is the capital city of Sudan in North East Africa. Over 1 million people live in Khartoum which is situated at the confluence of the Blue Nile and the White Nile. Khartoum was founded by the Egyptians in 1821 and became the capital of Sudan upon independence from the British in 1956. Khartoum is said to derive its name from the thin spit of land at the convergence of the rivers, which resembles an elephant's trunk (khurtum). Khartoum is really one of three cities in this area. There's Omdurman to the north-west across the White Nile, North Khartoum (the industrial heartland), and Khartoum itself on the southern bank of the Blue Nile. The image you see of Khartoum above is not exactly what most of the the city looks like from the ground up. War refugees from Chad, Ethiopia and other neighboring countries have flocked to Khartoum in the past few decades and there are plenty of slums. The odd building shaped like a boat sail is a recent addition to the skyline, it's a five-star hotel financed by the Libyan government. Booming oil revenues are slowly changing the city's landscape as the long civil war between Sudan's North and South ended in 2005. Khartoum and indeed Sudan is not a very popular tourist destination to say the least. Recent heavy fighting in Khartoum makes the city less than safe to visit at this time. Those that do make it however, always gush at the friendliness of the local population and hospitality despite the huge amount of poverty. Attractions include The National Museum of Sudan. Two reconstructed Egyptian Temples can be found in the gardens of the museum, they were salvaged from Nubia after the flooding of Lake Nasser. Sudan is actually home to more ancient pyramids than Egypt. The market across the river in Omdurman (a larger city than Khartoum) is excellent, the best time to visit is Friday morning. And there's an authentic camel market a few kilometers away. Sufi dancers, better known as whirling dervishes, perform their magic every Friday outside the Hamed al-Nil tomb in Omdurman (just south of the market). Check out this video to see what it's like. Continue to 34 of 45 below. Continue to 35 of 45 below. Abuja is the capital of Nigeria in West Africa, Africa's most populous nation. Just under 800,000 people live in Abuja (less than a tenth that live in Lagos, the old capital). Abuja is a planned city, it became Nigeria's capital city in 1991 and it's situated in the center of the country. Many developing nations have planned capital cities situated in the geographic center in order to maintain some political neutrality as well as create an economic base in a previously underdeveloped part of the country. Abuja was constructed during the 1980's. The downtown area is planned out and mostly completed. Multinationals have their headquarters here, embassies are based here, there's a mosque, church and a large national assembly. The outskirts of town are still somewhat of a mess with little in the way of modern conveniences such as electricity and running water. Shanty towns are growing in number as the rural population is drawn to the city in search of jobs. Planned cities generally have some out-of-place projects going on and Abuja is no exception with a huge planned amusement park being built, called Mataima Amusement Park. So far some of the attractions that have opened include rotating teacups, bumper boats and a photo booth. Phase two of the project will include a waterpark as well as a small zoo complete with some animatronics. This will be interesting in a city that experiences daily power cuts. Abuja is not a tourist destination since there isn't much in the way of sights to attract anyone. Businessmen however do come to Abuja and it has a reputation as being one of the most expensive cities in Nigeria as far as the price of hotels and restaurants are concerned. There is also not much in the way of public transportation, so you have to rely on taxis to get around. AbujaCity.com -- Web site geared to visiting businessmen. Continue to 36 of 45 below. Continue to 37 of 45 below. Rabat facts, information and travel resources can be found below this picture. Rabat is the capital city of Morocco in North Africa. Over 2 million people live in Rabat, making it the country's second largest city. Rabat is located on the Atlantic ocean, but Casablanca further south along the coast is the main port. Rabat is where the government is located, as well as the King of Morocco, but it's not the commercial capital (that would be Casablanca). Rabat has a rich history but is a fairly new capital, the French gave it this status in 1912 and it remained the capital as per the King's wishes, after independence in 1956. Rabat is a very pleasant capital, and not as congested as some other Moroccan cities. The boulevards are wide, the souqs are not too hectic and there's a cosmopolitan feel to the outdoor cafes and well-dressed middle classes that live and work here. As with many Moroccan cities, it's divided into the Medina (old-walled city) and the Ville Nouvelle (new city, built by the French). Arabic and French are the most common languages you'll hear on the streets of Rabat. Rabat has a small airport, Rabat-Sale Airport, just outside of town; serviced by Royal Air Moroc and Air France. Most visitors will arrive by train from Casablanca (where the main international airport is). Frequent trains from Casablanca take an hour to reach Rabat. Long-distance buses are also readily available from every major town in Morocco. More about: Train Travel and Getting Around Morocco. Take a petit-taxi to get around, make sure the meter is working. Riads, traditional homes converted into boutique hotels, are my favorite. Rooms aren't spacious, but they are gorgeous, intimate and in the heart of the medina. Rabat's best Riads include: Riad Kalaa, Dar el Kebira; and Riad Marhaba. The Medina -- More sanitized than Marrakech or Fes, the Medina in Rabat is a fun place to shop and stroll. Food, copper, carpets, leather, mint, western-style clothing -- it's all there. Kasbah des Oudaias -- a beautiful fortified city, on a bluff overlooking the ocean. The main gate leads to narrow streets inside the kasbah, stroll around and visit the oldest mosque in town. Chellah -- an ancient Roman site, very pretty with fruit trees and storks, and crumbling ruins. Hassan Tower -- famous landmark and close to the mausoleum housing the King's father and grandfather. Continue to 38 of 45 below. Continue to 39 of 45 below. Djibouti is the capital and largest city in the Republic of Djibouti in the Horn of Africa. Two thirds of the country's population live in the city. Djibouti city is situated on the coast, on the Gulf of Tadjoura right across from Yemen. In 1891 the French made Djibouti the capital of French Somaliland. Djibouti gained independence from France in 1977. The population of Djibouti is around 500,000 and they're largely of Somali, Afar and Arab descent. The inhabitants of Djibouti city are predominantly Islamic. Lac Assal, about 100 km from Djibouti city, is the lowest point on the African continent. This salt lake lies at 156m below sea level. The salt fields around the lake can reach depths of 65 meters. The Lonely Planet Guide describes Djibouti City as "a ramshackle little port village, with peeling colonial and modern buildings ... Unashamed Qat-chewing men, sensuous women swathed in superb shawls, proud but desperate Somali refugees, gaunt faced beggars and stalwart foreign legionnaires in their knee-length socks all roam the streets". The appeal of Djibouti city is to walk or cycle around, take it all in and enjoy the scene. Djibouti city is known for being more expensive than cities in neighboring countries, and you don't really get more value for your money. There aren't any obvious points of interest in Djibouti city except for the Central Market (Marche Central) which buzzes with activity in the mornings. By the afternoon, Djibouti city gets very quiet and it's not just the heat that folks are avoiding, but the national pastime - chewing Qat, begins in earnest. Qat (or Khat) is a mild narcotic. The leaves of the Qat plant are chewed, it has to fresh for the narcotic effect to work best. The daily Qat delivery from Ethiopia to Djibouti city arrives at around 1pm in the local markets. Djibouti's location on the Red Sea means there are some excellent diving and swimming opportunities particularly around the islands of Maskali and Moucha in the Gulf of Tadjoura. It takes 30-40 minutes to get to the islands by boat. Continue to 40 of 45 below. Continue to 41 of 45 below. Luanda is the capital city of Angola, located in Central-Southern Africa. More than 4 million people live in Luanda. Luanda is a cosmopolitan city, many people fled to the capital during the brutal civil war that destroyed much of the country from 1974-2002. It's located on the Atlantic Ocean, surrounded by natural beauty that is somewhat marred by the sprawling townships (bairros) and poor living conditions of its inhabitants. Luanda was founded in 1575 by Portuguese colonists and became a major slaving port. Since then, it has always been the cultural heart of Angola. It's a vibrant place with obvious Portuguese influences, excellent music and nightlife. It's one of the world's most expensive capitals to stay in, due to the fact that Angola is rich in diamonds and oil, so business men abound, but hotel rooms do not. Portuguese is the main language spoken in Luanda. Angola's international airport (in Luanda) has regularly scheduled flights from major European and regional capitals. Luanda is built around its harbour and overlooks a thin long island -- Ihla. The heart of the city is known as the Marginal, it runs along the harbor promenade. Luanda has many interesting sights given its rich history and location on the coast. Fortaleza de Sao Miguel -- oldest surviving building in Luanda, built in 1576 by the Portuguese. Palacio de Ferro - built by Gustave Eiffel no less in 1902. There are few hotels and all are overpriced, the best is Hotel Alvalade. Bars and restaurants along the Ilha are popular with locals and tourists alike, try a Caipirinha. You can get excellent fresh seafood, local snacks, Portuguese, and Chinese cuisine. Continue to 42 of 45 below. Windhoek is the capital city of Namibia. Windhoek means "windy corner" in Afrikaans and its location on a relatively flat plateau at an altitude of 5600 feet (1700m), may explain the origins of the name. Windhoek was founded in the 1890's by German soldiers who appreciated the natural springs the area offered and its location between two of Namibia's main tribes at that time, the Nama and Herero. Today, Windhoek has a multi-ethnic population of around 300,000 residents. Windhoek is the largest city, as well as the commercial capital of Namibia. Windhoek is located bang in the middle of Namibia. Windhoek is a pleasant city, the city center is clean and well planned out. Most notable is its German architecture. It is home to the University of Namibia. The crime rate is not very high, but watch out for pickpockets. It can get very hot during the midday, especially in summer (up to 40 C), but it's usually dry, and it always cools down at night. You're likely to hear people speaking Afrikaans, German, English and a variety of local languages. Most international visitors will arrive at Windhoek's Hosea Kutako International Airport, 30 miles out of town. Regional and domestic air passengers usually land at Eros airport, 4 miles out of town. Luxury buses operate regularly between Cape Town (20 hrs), Johannesburg (25 hrs), Victoria Falls (20 hrs) and Windhoek . Katutura Township - Katutura is Windhoek's liveliest township, you can take a bike tour or a walking tour. Christ Church - a lovely Lutheran church built in 1896. Windhoek castles -- "Sanderburg", "Schwerinsburg" and "Heinitzburg" offer up colonial architecture in lovely settings on the outskirts of the city. The Heinitzburg is now a luxury hotel and the other two are private homes. Alte Feste Fort - now the National Museum with exhibits on Namibia's struggle for independence (which finally came in 1990). Restaurants - Don't miss Joe's Beerhouse. Hotels, B & B's and guesthouses are plentiful in Windhoek - check out these listings. Shopping - you'll find craft markets around the Post Street Mall and my favorite Bushman Art and Museum gallery on Independence avenue. Excellent crafts are also sold on the road to Swakopmund. Continue to 43 of 45 below. Continue to 44 of 45 below. Guide to Bamako, Mali's capital city. Information about Bamako, getting there, where to stay, what to see and more, below. Bamako is the capital city of Mali in West Africa. Bamako is Mali's biggest city with a population of around 1.7 million. Bamako was a small fishing village in 1806 when the famous Scottish explorer Mungo Park stopped by. By 1908 the French had colonized much of West Africa and made Bamako a regional capital. Mali gained independence in 1960 and kept Bamako as the capital city, now one of the fastest growing cities in the world. Bamako lies on the banks of the Niger river. It's a sprawling city, filled with life, outdoor markets, music, pollution, dust and mud (depending on the season). The name Bamako means "crocodile river" in the local language, Bambara. Besides Bambara, you'll hear plenty of French spoken in Bamako. Most tourists arrive in Bamako by air; Air France, Royal Air Moroc, Ethiopian Airlines, and Kenya Airways (and other regional airlines) land at the Senou International Airport. A railway line connects Bamako to Dakar (Senegal) as well, but it's slow . Taxis are the best way to get around Bamako. Shared taxis are cheaper, they have the sign "taxi" on them. Dourounis are also commonly available (green minibuses with set routes). Markets -- fetish markets, clothing markets and food markets all make for a colorful scene in Bamako. Ask a local to direct you to where they shop for the least hassle. Musee National -- Carvings, masks and textiles fro around Mali can be seen in this small museum. Bamako Grand Mosque -- Lively market around this large mosque. Banks of the Niger -- lots of beautiful gardens and you can get great shots of women washing their clothes (see photo above). Good restaurants in Bamako include: Le San Toro, Malian cuisine; Sukhothai, Thai cuisine; and the African Grill. Baguettes and pastries are readily available in Bamako for a quick snack. Live music in Bamako is a real treat. Don't be surprised to see blonde Russian ladies working it. Listen to music at: Club Djembe; Hippo d'Or, Le Hogon, and L'Exodus. Continue to 45 of 45 below. Accra is the capital city of Ghana in West Africa. Almost 2 million people live in Accra, making it Ghana's most populated city. Accra has been Ghana's capital since 1877 when the British ruled this part of West Africa. Before that, Accra was a collection of Ga villages established in the 17th Century. Accra is a sprawling city, with a mixture of modern buildings, shanty towns, occasional castle and lively markets. The central commercial hub is around the Makola Market (pictured here). Just south of the market is the Atlantic ocean (Gulf of Guinea). Accra's shanty towns are mostly to the west of the city center. East of the city center and north towards the Kotoka international airport, is where you'll find most of the hotels, embassies and smarter residential areas. The most common languages in Accra are English, and Ga.
Accra is one of Africa's safer capitals. It's easy to get around Accra by tro tro or private taxi. Most of the areas are quite walkable, but it is hot and humid, so stay hydrated with the readily available coconut stands and water baggies. At night it's best not to walk alone on the beach. You don't really need a private guide, but if you are traveling alone it's always nice to have company who knows where to go and what to see. Check out Jolinaiko Eco-Tours for exceptional rates and service, I had a flawless vacation thanks to them. Best Time to Visit Accra? Makola Market - Bring along a sense of humor, and leave your camera and valuables behind, Makola market is fantastically hectic. Everything you ever thought could possibly be bought or sold can be found here. Unlike some of the bars in Accra, this is a place teeming with women. Labadi Beach - My first Accra experience was at Labadi beach. I'd just come off a long haul flight from the US and wanted to get a late lunch. I navigated the a tro tro system with some local help, and headed to Accra's most popular beach. I settled down to an ice cold Star lager, followed by delicious fried fish and spicy jollof. What a start to a vacation! Oxford Street, Osu - It's hip and happening on Oxford Street (Cantonments Road) in the upmarket area of Osu. Some of Accra's best restaurants, bars and shops are on this drag. Stalls selling fake rolex watches, pirated CD's and football shirts line the street, traffic is bumper to bumper, all adding to the general exuberant atmosphere. The National Museum has wonderful displays about Ghana's culture and history including the slave-trade, and Ashanti Kingdom. The museum is open daily from 9am - 5pm. Artists Alliance Gallery - If you are at all interested in contemporary art or fine art, you will be blown away by the Artists Alliance Gallery. I spent half a day here, and could not got enough. Huge metal sculptures mix with antique Asafo flags, kente cloth, furniture, and fantastic masks. One of Ghana's most respected artists, Ablade Glover is responsible for this three story treasure-trove. More details and sights in Accra; More sights in Ghana. Hotels are plentiful in Accra. The Lonely Planet Guide has the best selection of budget hotels. Here's my personal selection of favorite hotels in Ghana. Restaurants and Bars -- You can eat good Indian food in Accra as well as traditional Ghanaian fare and of course lots of fresh seafood (even sushi). Check out these restaurant reviews. For fast food head to Osu. For live music check out this list of venues. The best way to get around Accra is to take a tro-tro (shared taxi) or private taxi. Taxis are easy to flag down just make sure you agree to a price before you head to your destination. Daily news from Accra's Daily Mail.